Abraham Lincoln was born in a log cabin in Kentucky to Thomas and Nancy Lincoln. 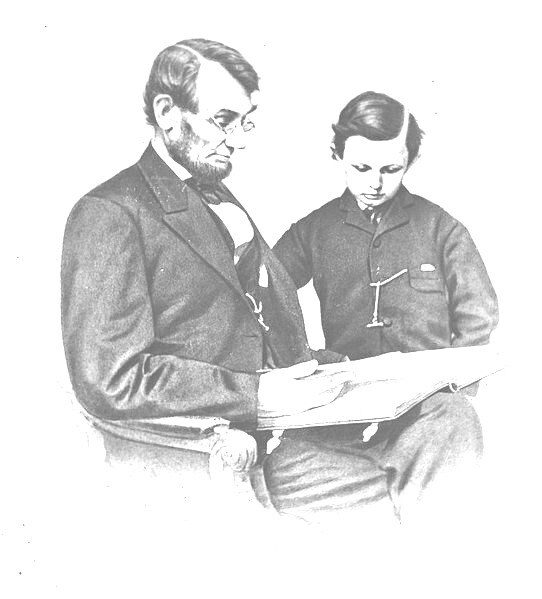 The family moved to Indiana and 8 year old Abe helped his father build another log house. A year later his mother died and the house was very empty. His father remarried and in addition to his sister Sarah, who was 3 years older, there were now 3 more children in the family. Lincoln had less than a year of schooling. Books were scarce and so was paper. He worked his arithmetic problems on a board and cleaned the board with a knife so he could use it again. The family owned a Bible and he spent many hours reading it. He would copy parts of it in order to memorize it. Sometimes he would walk for miles to borrow a book. One of his favorite books was "The Life of George Washington". By the time he was 17, he knew he wanted to be a lawyer. He would walk 17 miles to the county courthouse in order to watch the lawyers work. He sat in the back of the courtroom and watched them as they shook their fists and became red in the face. Then he would go home and think about what he had seen. shortchanged* a woman by 6 cents, and he followed her home so he could give the money back to her. When he was a postmaster, he tried to learn how to get along with people well. When he was a surveyor;* a person who measured land, he tried to always be accurate in his measurements. He still wanted to be a lawyer. He would go without sleep in order to study. He would borrow books from a neighbor in the evening, read them by the light of the fireplace, and take them back in the morning. In 1836 he passed the test and became a lawyer. It was during this time he was he was elected to the Illinois legislature. * by the Whig party. He became good at debating and public speaking. He had many debates with John Calhoun regarding the tariff question. They spoke before large audiences, sometimes as long as four hours. Lincoln and Stephen A. Douglas participated in several debates concerning the question of slavery. They had a previous encounter at the State Fair in Springfield, Illinois. Lincoln would lose the senate race, but would win over Douglas in the 1860 presidential race. Once a woman wrote an article containing some ridiculing remarks about General James Shields. The editor spoke to Lincoln about it and Lincoln said, "Tell him I wrote it." That's what he did and Shield challenged Lincoln to a duel with Lincoln's choice of weapons. On the appointed day Lincoln arrived with a sword in one hand and a hatchet in the other. A man, John J. Hardin, stopped the fight before it started. The event possibly changed the course of the nation's history. He was inaugurated* president in March of 1861. Five weeks later the Civil War began. It was a fight about slavery. Lincoln wanted the United States to remain one nation. It was in danger of being divided into two nations; the North and the South. In his 1860 inaugural address, he said: "I have no purpose, directly or indirectly, to interfere with the institution of slavery in the states where it exists. I believe I have no lawful right to do so, and I have no inclination to do so." Two years later, President Lincoln wrote: "My paramount object in this struggle is to save the Union, and is not either to save or to destroy slavery. If I could save the Union without freeing any slave I would do it; and if I could save it by freeing some and leaving others alone I would also do that. What I do about slavery, and the colored race, I do because I believe it helps to save the Union (Letter to Horace Greeley, August 22, 1862)." He quoted from the Bible, " A house divided against itself cannot stand." He was able to realize both of his goals. In 1863 he issued the Emancipation* Proclamation freeing the slaves in the Southern states, and the country was able to remain a united nation. Eventually all the slaves in the United States became free. We get an insight into the life of Abraham Lincoln when we read an article which appeared in an Athens, Ohio newspaper June 8, 1860. On April 14, 1865 President Lincoln and Mrs. Lincoln were attending a play at Ford's Theater in Washington D.C. While there he was assassinated by John Wilkes Booth, an actor with extremist views concerning politics and slavery. There had been a conspiracy by Booth and his cohorts to not only kill the president, but also William Henry Seward, and Andrew Johnson, the vice-president. The attack on Seward failed and the one on Johnson was never carried out. The president, after being shot, was carried to a house across the street from the theater and died nine hours later. Booth was killed by one of the men trying to apprehend him. 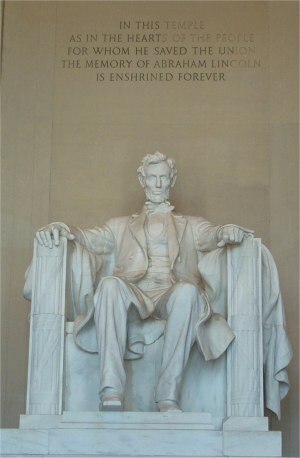 Of all the presidents, Abraham Lincoln is the one in whom there is the greatest continuing interest. School children study him, historians debate his life and legacy, and people collect memorabilia about him. Vietnamese translation of this article. Portuguese translation of this article. Spanish translation of this article. written about Nancy Hanks, Abe's mother. At biography.com search for Abraham Lincoln. Press "Go" to search for books about Abraham Lincoln. 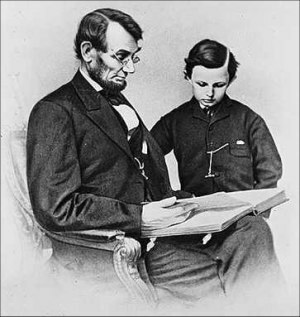 The picture of Abraham Lincoln and his fourth son, Tad may be used without permission. It is in the public domain and was found at the Library of Congress. 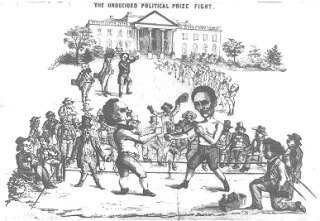 Lincoln political cartoons at Wikipedia. HELLO!!! ABRAHAM LINCON DID SO GOOD! Thank you for this resource! I enjoyed reading it with my first grader! This page displayed 740,752 times.